Photo(s) by Taylor BrownEnjoy a drink at Hotel Indigo's rooftop bar. Traverse City, widely known as the nation’s “Cherry Capital,” is a culinary and cultural hub of Northern Michigan. 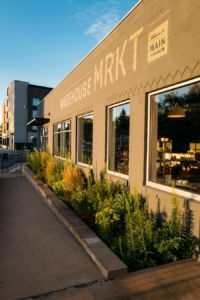 It’s a hip, foodie town with restaurant options ranging from upscale Italian served in a former state-run hospital to a farm-to-table restaurant situated downtown in a historic home. 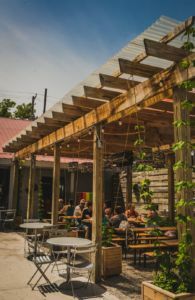 But, it’s also a place where you can come to escape the daily grind, as hiking areas, biking trails, and beaches are basically integrated into the city—making an urban escape incredibly easy. Travel outward from town to visit countless wineries and breweries, or spend a day boating in the sun. 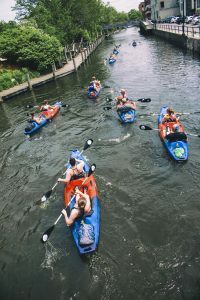 Read on to discover travel ideas and useful links to help plan your Traverse City vacation, whatever your vacation flavor may be. Only staying for the weekend? Here’s how to have the best TC vacation. Ever. Depending on the type of vacation you’re looking for, there are a variety of hotels situated throughout the greater Grand Traverse area that will provide you the perfect place to come home each night. 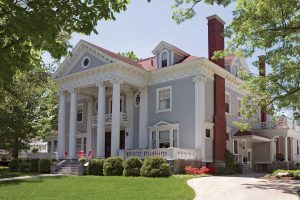 If you’re looking for a more urban vacation, with easy access to shopping and dining, check out hotels like the historic, 190-year-old Wellington Inn, located just steps away from downtown Traverse City in a quaint neighborhood. Or, stay at the downtown Park Place Hotel. Completed in 1930, the hotel was once the tallest standing building in the Grand Traverse area at 10 stories tall. If you want to immerse yourself in the wineries and idyllic countryside, stay at a Bed & Breakfast in the heart of wine country on Leelanau Peninsula, which is situated northwest of Traverse City, or Old Mission Peninsula, which is directly north of Traverse City. Check out Neahtawanta Inn, with more than 300 feet of beachfront on Bowers Harbor. If you’re looking for a relaxing beach vacation, there are a number of hotels on East Grand Traverse Bay and beyond that are just a short car or bike ride into downtown Traverse City. Popular choices include the Sugar Beach Resort Hotel and The Bayshore Resort. Find a room at the perfect Traverse City hotel with MyNorth’s hotel/motel directory! Catch a movie outside at the Open Space during the Traverse City Film Festival! 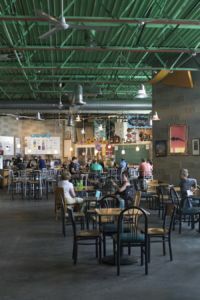 Held at the Grand Traverse Commons, this one-day festival in June of each year celebrates all that makes Traverse City such a unique place—culture, food, and wine (the ultimate trifecta). Traverse City’s most popular festival, and for good reason, too. Going much beyond its namesake, there’s live music, fireworks, parades and foot races during this early July, weeklong extravaganza. But of course, there’s cherry pie-eating contests, a cherry pit spit contest (yes, you read that right), and countless cherry products. 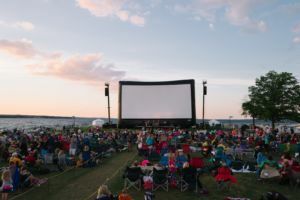 The founder and president of this late July-early August festival, Michael Moore, is committed to bringing “just great movies,” to Traverse City, and year after year, he delivers on this promise. There are screenings, parties, and salons that provide attendees the opportunity to engage with the films in elevated, yet relaxed ways. Visit both the State Theatre or the Bijou by the Bay year-round to get a taste of what the TCFF offers. This festival is one with a cause. It’s about celebrating craft brew—one of Traverse City’s fastest growing industries—and music. But, the festival in late August simultaneously raises money for local nonprofits. There’s so much to love about this festival—it features over 40 craft breweries, it’s a zero-waste event, and it’s held at the beautiful Village at Grand Traverse Commons. Tickets to the Microbrew & Music Festival are available at MyNorthTickets.com. Click the cover for your FREE Traverse City Vacation Guide!